Our group creates a wide variety of research products, including academic books and papers, materials for public audiences, and our blog. We also give talks to groups of specialists and the public, worldwide, and produce widely used open-source software. Check it all out below. Pence, C.H. Under contract. Causes and Probability in Evolution [working title] . Cambridge: Cambridge University Press. 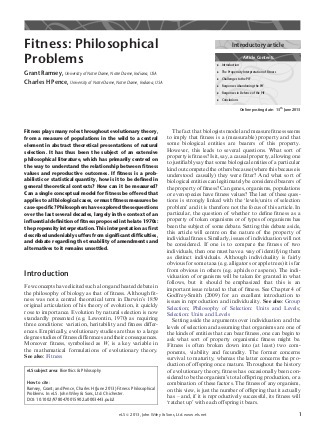 An opinionated introduction to the debate over probability, statistics, and causation in the foundations of evolutionary theory, to be written for Cambridge’s Elements series. Pence, C.H. Forthcoming (under contract). “ How Not to Fight About Theory: The Debate Between Biometry and Mendelism in Nature, 1890–1915 .” In The Dynamics of Science: Computational Frontiers in History and Philosophy of Science, Ramsey, G. & De Block, A., eds. Pittsburgh: University of Pittsburgh Press. 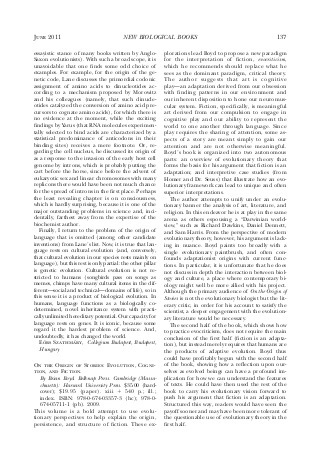 A book chapter looking at the network of discourse in debates over genetics in the correspondence pages of Nature at the turn of the twentieth century. Pence, C.H. 2019. 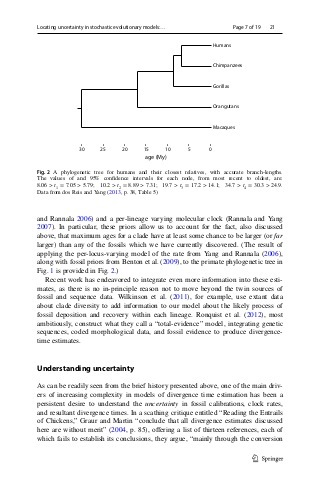 “ Locating Uncertainty in Stochastic Evolutionary Models: Divergence Time Estimation .” Biology & Philosophy 34: 21. A presentation of some contemporary results from divergence time estimation and their impact on interpretations of chance in the philosophy of biology. Pence, C.H. 2018. “ [Review of] Buckets from an English Sea: 1832 and the Making of Charles Darwin by Louis B. Rosenblatt .” The Quarterly Review of Biology 93 (4): 356. Reviewed work: Rosenblatt, L.B. 2018. Buckets from an English Sea: 1832 and the Making of Charles Darwin. Oxford: Oxford University Press. Pence, C.H. & Ramsey, G.R. 2018. 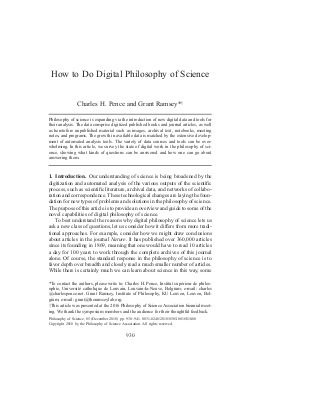 “ How to Do Digital Philosophy of Science .” Philosophy of Science 85 (5): 930–941. Based on a symposium at the 2016 PSA, Grant and I offer some tips for those interested in engaging in digital projects in the philosophy of science. Pence, C.H. 2018. 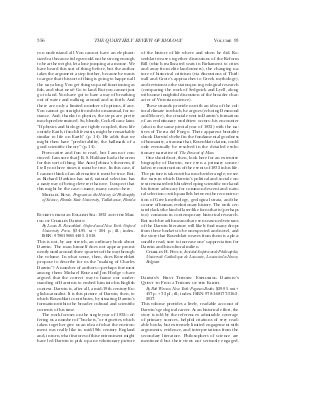 “ [Review of] Origins of Darwin’s Evolution: Solving the Species Puzzle Through Time and Place by J. David Archibald .” The Quarterly Review of Biology 93 (2): 128–129. Reviewed work: Archibald, J.D. 2017. Origins of Darwin’s Evolution: Solving the Species Puzzle Through Time and Place. New York: Columbia University Press. Pence, C.H. 2018. 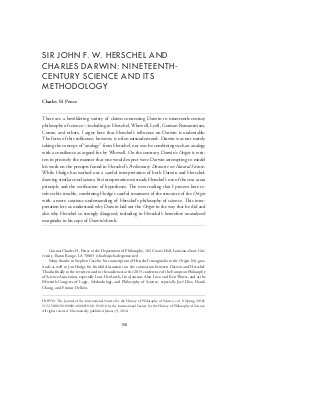 “ Sir John F. W. Herschel and Charles Darwin: Nineteenth-Century Science and its Methodology .” HOPOS 8 (1): 108–140. Darwin had many influences, but perhaps the most significant on the structure of the Origin was Sir John Herschel’s Preliminary Discourse. I explore the shape and nature of that influence here. Pence, C.H. & Swaim, D.G. 2018. 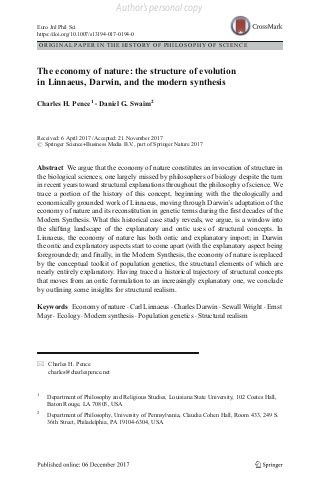 “ The Economy of Nature: The Structure of Evolution in Linnaeus, Darwin, and Toward the Extended Synthesis .” European Journal for Philosophy of Science 8 (3): 435–454. We consider the status of the economy of nature as a structuring concept in biological theory, from Darwin to the present, with reference to current debates over structural realism. Pence, C.H. 2017. 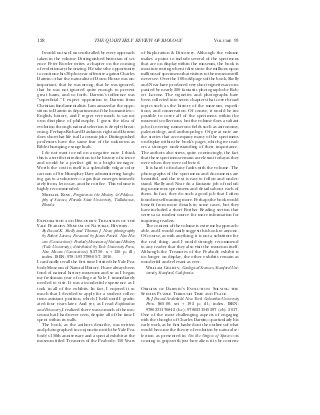 “ [Review of] Robert J. Richards and Michael Ruse, Debating Darwin .” HOPOS 7 (2): 397–400. Reviewed work: Richards, R.J. & Ruse, M. 2016. Debating Darwin. Chicago: University of Chicago Press. Pence, C.H. 2017. “ Is Genetic Drift a Force? ” Synthese 194 (6): 1967–1988. Mendelson, T.C., Fitzpatrick, C.L., Hauber, M.E., Pence, C.H., Rodriguez, R.L., Safran, R.J., Stern, C.A., & Stevens, J.R. 2016. “ Cognitive Phenotypes and the Evolution of Animal Decisions .” Trends in Ecology and Evolution 31 (11): 850–859. Work with a group of biologists, coordinated through the National Evolutionary Synthesis Center. Offers a new framework for understanding animal decisions which takes into account insights from human psychology. The figshare data here describes a textual analysis that was removed from the article in draft. Ramsey, G. & Pence, C.H. 2016. “ Chance in Evolution from Darwin to Contemporary Biology .” In Chance in Evolution, Ramsey, G. & Pence, C.H., eds. Chicago: University of Chicago Press , pp. 1–11. 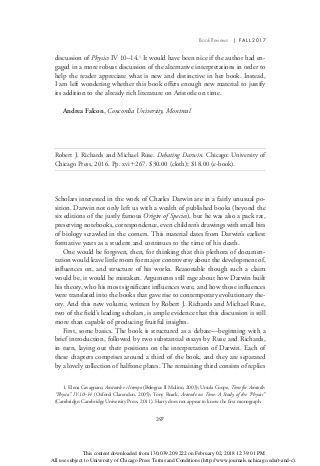 The editors’ introduction to our edited volume, covering the scope of the work and offering some thoughts on the taxonomy of chance in evolution. Ramsey, G. & Pence, C.H., eds. 2016. Chance in Evolution . Chicago: University of Chicago Press. 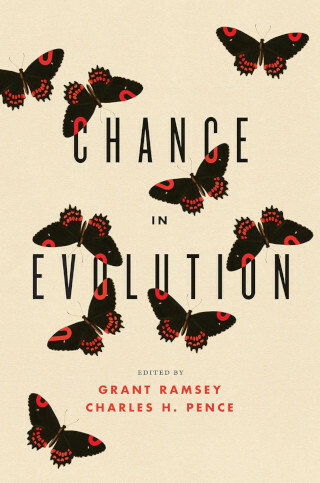 An edited volume with contributions from philosophers, historians, biologists, and theologians on the role of “chance” in evolutionary theory. Ramsey, G. & Pence, C.H. 2016. “ evoText: A New Tool for Analyzing the Biological Sciences .” Studies in History and Philosophy of Biological and Biomedical Sciences 57: 83–87. 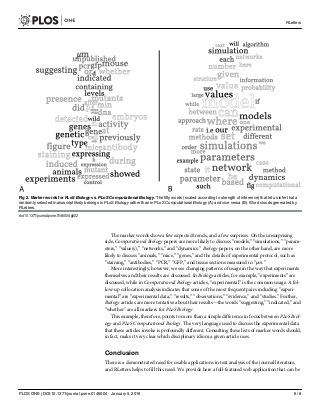 An application note introducing the evoText project, a text-mining tool for analyzing the biological journal literature. Pence, C.H. 2016. “ RLetters: A Web-Based Application for Text Analysis of Journal Articles .” PLoS ONE. An application note introducing RLetters, a tool designed to allow the textual analysis of large journal article corpora. Pence, C.H. & Ramsey, G. 2015. 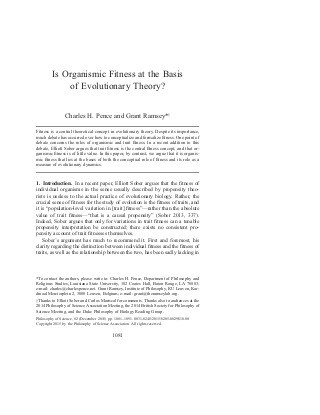 “ Is Organismic Fitness at the Basis of Evolutionary Theory? 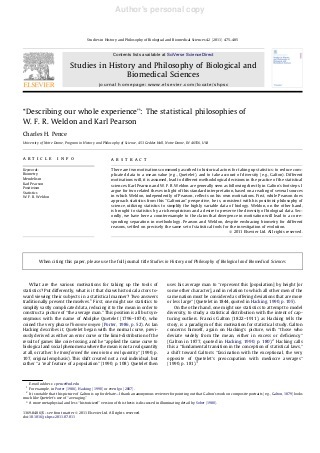 ” Philosophy of Science 82 (5): 1081–1091. It is often claimed (e.g., in a recent article by Sober (2013)) that trait fitness is where the genuine “action” can be found in evolutionary theory, and that individual fitness is theoretically secondary. We clarify this relationship by distinguishing two roles that fitness plays in biology, and arguing that individual fitness lies at the conceptual foundation of ascriptions of the fitness of traits. Pence, C.H. 2015. 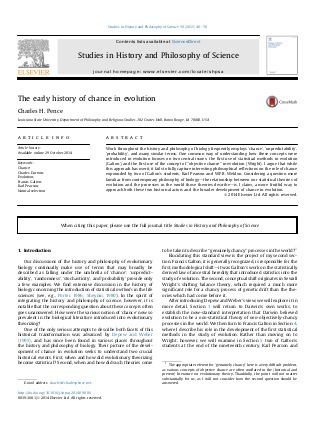 “ The Early History of Chance in Evolution .” Studies in History and Philosophy of Science 50: 48–58. Pence, C.H. 2015. “ Military Genomic Testing: Proportionality, Expected Benefits, and the Connection between Genotypes and Phenotypes .” Journal of Law and the Biosciences 2 (1): 85–91. 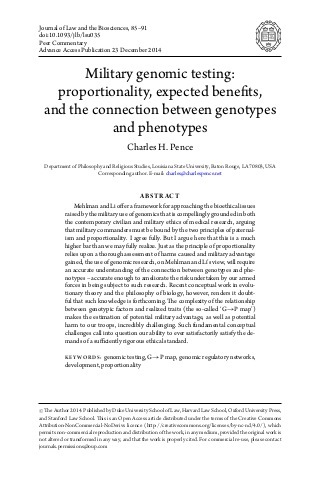 A commentary on a framework for ethical decision making in military genomic research by Mehlman and Li, in which I argue that significant caution is required, thanks to conceptual results from the philosophy of biology on the relationship between genotypes and phenotypes. Pence, C.H. 2015. 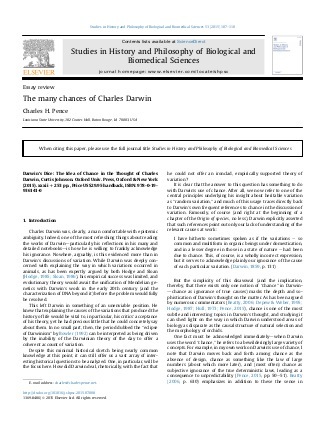 “ The Many Chances of Charles Darwin [Essay Review] .” Studies in History and Philosophy of Biological and Biomedical Sciences 53: 107–110. Essay review of: Johnson, C. 2015. Darwin’s Dice: The Idea of Chance in the Thought of Charles Darwin. Oxford: Oxford University Press. Pence, C.H. 2015. 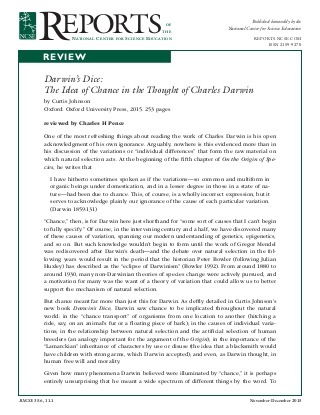 “ [Review of] Darwin’s Dice: The Idea of Chance in the Thought of Charles Darwin .” Reports of the National Center for Science Education 35 (6): 11. Reviewed work: Johnson, C. 2015. Darwin’s Dice: The Idea of Chance in the Thought of Charles Darwin. Oxford: Oxford University Press. Pence, C.H. 2014. 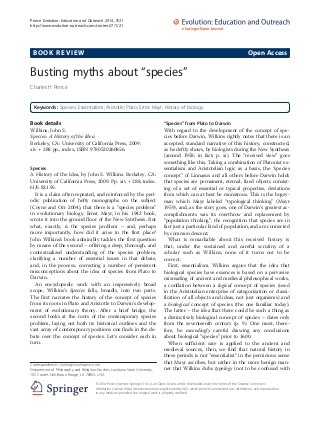 “ Busting Myths about ‘Species’ [Review of Species: A History of the Idea, by John Wilkins] .” Evolution: Education and Outreach 7: 21. Reviewed work: Wilkins, J.S. 2009. Species: A History of the Idea. Berkeley: University of California Press. Pence, C.H. Dissertation. 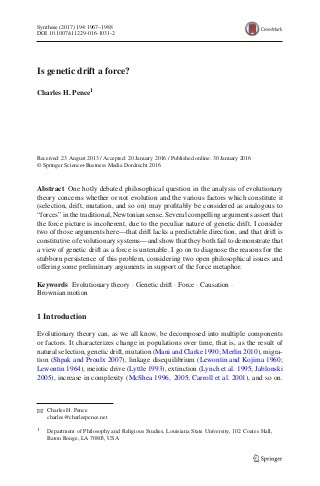 Chance in Evolutionary Theory: Fitness, Selection, and Genetic Drift in Philosophical and Historical Perspective . An examination of the relationship between Darwin and Herschel’s philosophy of science. I argue for a new reading of this connection, based on a careful reading of Herschel and his critiques of Darwin’s theory. Pence, C.H. & Ramsey, G. 2013. “ A New Foundation for the Propensity Interpretation of Fitness .” British Journal for the Philosophy of Science 64 (4): 851–881. 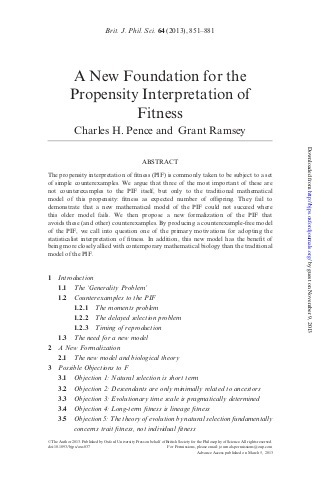 We apply some results from mathematical biology to show that there is no reason to think that a modified formulation of the propensity interpretation of fitness cannot survive several common counterexamples to the traditional PIF. Ramsey, G. & Pence, C.H. 2013. “ Fitness: Philosophical Problems .” eLS. An entry on the philosophical interpretation of fitness for Wiley’s Encyclopedia of the Life Sciences. Pence, C.H. 2013. “ [Review of] Staffan Müller-Wille and Hans-Jörg Rheinberger, A Cultural History of Heredity .” HOPOS 3 (1): 168–172. 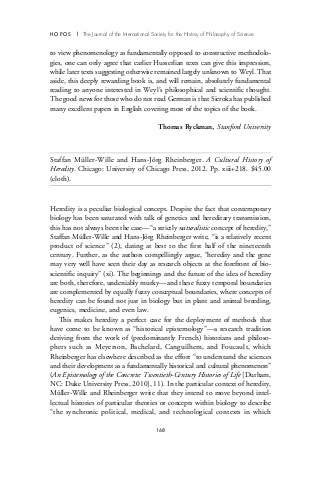 Reviewed work: Müller-Wille, S. & Rheinberger, Hans-Jörg. 2012. A Cultural History of Heredity. Chicago: University of Chicago Press. Hollocher, H., Pence, C.H., Ramsey, G., and Wirth, M.M. 2013. “ A Path to Success? 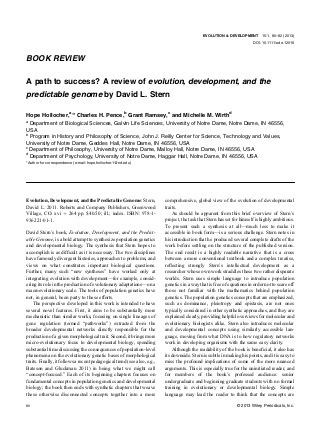 A Review of Evolution, Development, and the Predictable Genome by David L. Stern .” Evolution and Development 15 (1): 80–82. Reviewed work: Stern, D.L. 2011. 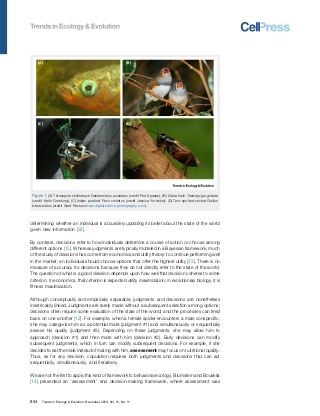 Evolution, Development, and the Predictable Genome. Greenwood Village, CO: Roberts and Company Publishers. Philip, J.T., Pence, C.H. & Goodson, H.V. 2012. 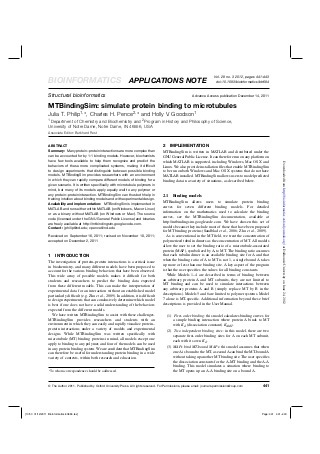 “ MTBindingSim: Simulate Protein Binding to Microtubules .” Bioinformatics 28 (3): 441–443. An application note introducing MTBindingSim, a tool for classroom simulation of binding to microtubules. Pence, C.H. & Buchak, L. 2012. “ Oyun: A New, Free Program for Iterated Prisoner’s Dilemma Tournaments in the Classroom .” Evolution: Education and Outreach 5 (3): 467–476. 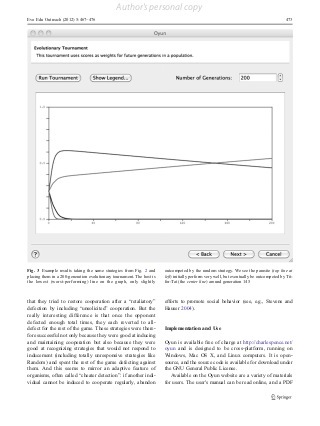 An application note describing Oyun, software for running iterated prisoner’s dilemma tournaments. Pence, C.H. 2011. “ ‘Describing Our Whole Experience’: The Statistical Philosophies of W.F.R. Weldon and Karl Pearson .” Studies in History and Philosophy of Biological and Biomedical Sciences 42 (4): 475–485. I argue here for a new view of the philosophy of W.F.R. Weldon, distinct in interesting and important ways from the positivism of Karl Pearson. Pence, C.H. 2011. 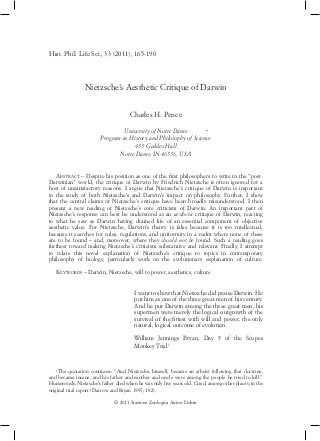 “ Nietzsche’s Aesthetic Critique of Darwin .” History and Philosophy of the Life Sciences 33 (2): 165–190. Hollocher, H., Fuentes, A., Pence, C.H., Ramsey, G., Sportiello, D.J. and Wirth, M.M. 2011. “ [Review of] On the Origin of Stories: Evolution, Cognition, and Fiction .” The Quarterly Review of Biology 86 (2): 137–138. Reviewed work: Boyd, B. 2009. On the Origin of Stories: Evolution, Cognition, and Fiction. Cambridge, MA: Harvard University Press. Pence, C.H., Hollocher, H., Nichols, R., Ramsey, G., Siu, E., and Sportiello, D.J. 2011. “ [Review of] Elliott Sober: Did Darwin Write the Origin Backwards? 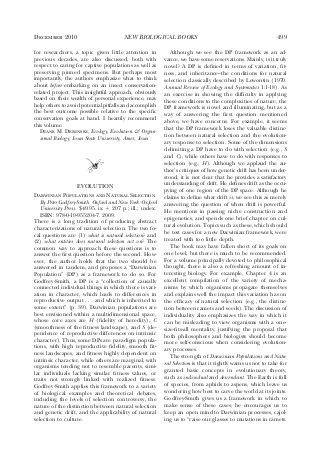 Philosophical Essays on Darwin’s Theory .” Philosophy of Science 78 (4): 705–709. Reviewed work: Sober, E. 2011. Did Darwin Write the Origin Backwards? Philosophical Essays on Darwin’s Theory. Amherst, NY: Prometheus. Ramsey, G., Hollocher, H., Fuentes, A., Pence, C.H. and Siu, E. 2010. 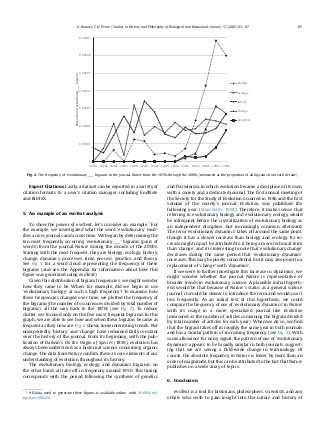 “ [Review of] Darwinian Populations and Natural Selection .” The Quarterly Review of Biology 85 (4): 499–500. 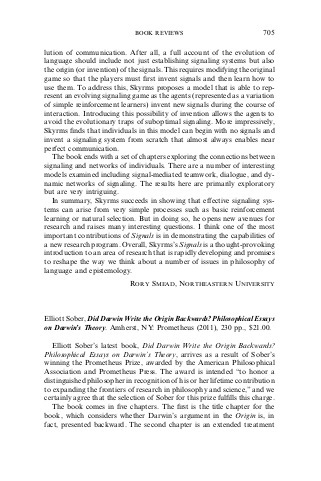 Reviewed work: Godfrey-Smith, P. 2009. Darwinian Popluations and Natural Selection. Oxford: Oxford University Press. Pence, C.H. In preparation. Putting Process and Product Conceptions of Natural Selection and Genetic Drift to the Test . This paper argues for two claims. First, the question of whether selection and drift should be defined as processes or as products is independent of their causal efficacy. Second, there exist biological cases that can be used to separate these process and product notions. Two cases presented weigh in favor of process definitions, though this does not suffice to resolve the question. The lab is always interested in talking about our work to any audiences who would like to hear about it. Send Prof. Pence an email and we’d love to set something up. Why Should We Value Biodiversity? What is Evolutionary Fitness For? Is Organismic Fitness at the Basis of Evolutionary Theory? Prof. Pence was interviewed by Jackson Wheat for his channel on Youtube.